Mounts Quickly and easily to Any Vehicle or rental car In Less Than 2 Minutes! kupper Mounts were born to roam, bike Worldwide! Kupper Mount Bike Racks are Perfect for Traveling with a Bike on Airplanes & Trains. They Will Fit on any vehicle or Rental car, Van or SUV, regardless of Country. Easily fits inside a book bag for easy packing. 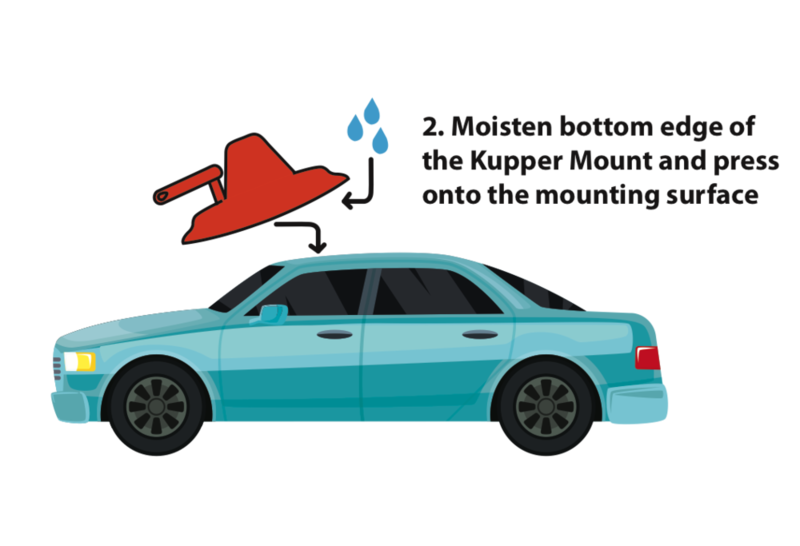 Kupper Mount System mounts on any vehicle. Installs in less than 2 minutes. Carry any bike up to 45 lb. Works with drop outs, thru-axle adapters, mountain and road bikes. 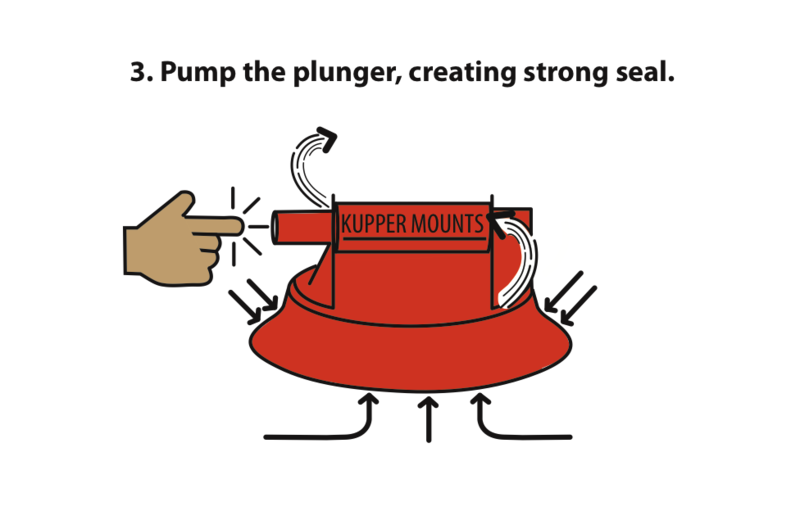 Kupper Mounts pull a vacuum between the mount and your vehicles surface, creating a strong long lasting hold. Kupper Mount Racks make use of a fork-mount, or fork-mount with thru-axle adapter. The Kupper Mount comes standard with quick-release fork mount for 9mm skewers. The Kupper Mount is not only the world's most portable bike rack, but also the most affordable. Easily fits in your checked baggage for airline or train travel and solves the common problem of finding a bike rack for a rental car. Also great when traveling with friends because most cars, vans, trucks and SUVs can carry up to four bikes on a single vehicle using roof tops and windows! 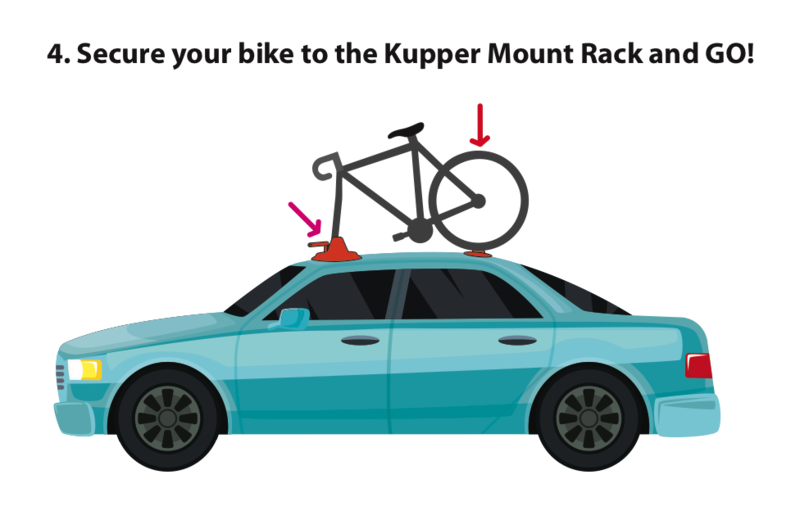 The Kupper Mount Complete Bike Rack System fits most types of vehicles. SUVs, sedans, vans, busses, trucks, cars, electric vehicles and even convertibles. It can be mounted in less then 2 minutes, carried in a book bag, and take your bike anywhere at anytime. It is designed to be durable, reliable, strong and adaptable. Security Tether: With a steel-braided line running though the center of the strap, this locks your bike to you vehicle. Simply loop through bike frame and drop the end into your vehicle’s door, trunk, or hatch. Cam-Buckle Strap: Use this in place of the Rear Kupper Mount when mounting your bike on the rear of a vehicle where the Rear Kupper Mount can’t be applied. Simply loop through your rear stays or wheel, attach flat PVC coated hook to either the bottom lip of trunk lid or the bumper, then cinch tight. Pedal-Stay Velcro Strap: Wrap this around your crank arm and bike frame to keep your pedals from back-spinning while traveling down the road. All-In-One Carrying Case*: Your Kupper Kit has a home! Store your entire Kupper Mount System in the conveniently portable carrying case when not carrying your bike. *Image is only for representation purposes and is not the actual case design. Hanging with the Kupper, literally... Kupper Mounts are strong enough to hold me and my bike. #kupperstrong #kupperlife #bikerack #cycling #bikelife #kickstarter coming soon!